In the year 1905, Armour Boulevard was still a wide dirt road, but well-off Kansas City families were moving to the new area called Hyde Park and building modern new mansions. This photo was taken that year along Armour looking east from Warwick. 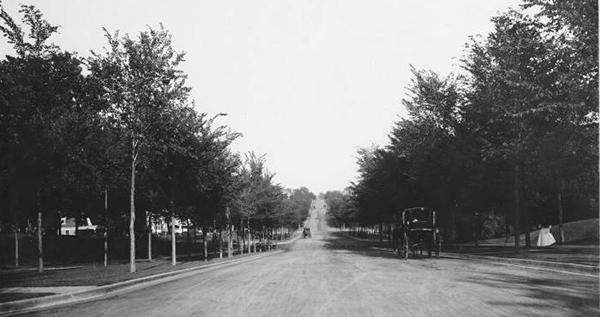 In the early 1900s, Armour Boulevard and its surrounding blocks were the center of life for many wealthy Kansas Citians, who built large mansions and lived a comfortable life attended by their servants. That’s true of the block between Armour and 36th Street from Walnut to Warwick. But by 1940, Armour’s elite residents had moved on and their mansions had taken on new lives as commercial buildings. As part of our Uncovering History Project, the Midtown KC Post is taking a look at each block in Midtown, including a set of 1940 tax assessment photos which is available for many blocks. (Many people seem confused by the tax assessment photos, which all include a man holding a sign. Here’s the story behind them). The photos of today’s block, from Armour and 36th Street from Walnut to Warwick, are not of the best quality, but they hint at what the block looked like during the transition of the area. 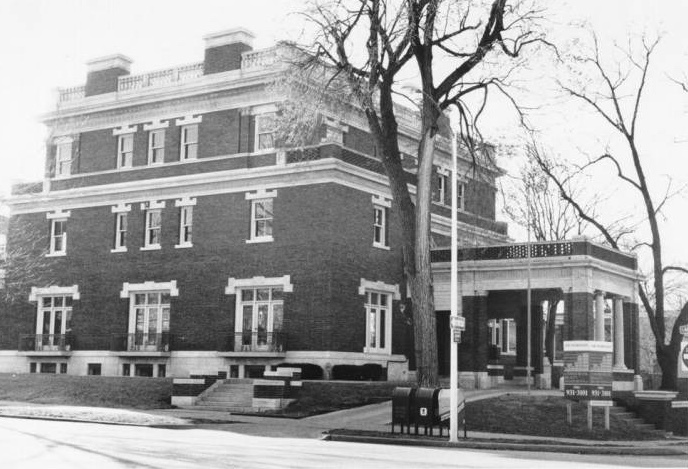 The Kansas City Star in 1906 pointed out the unusual features of the new Toll mansion, which included a lack of ornamentation on the outside, hot water heat and seven bathrooms. Millionaire lumberman Albert Toll’s unusual mansion at 3500 Warwick, built in 1907, still stands high above other buildings on the block. The Toll family moved north from their former home on the southwest corner of Warwick and 36th that year. Their neighbors included Banker Walton Holmes at 3510 Warwick, real estate man William Hall at 3521 Walnut, and lumber dealer Egbert Chapman at 3523 Walnut. In 1909, “cracker king” Jacob Loose of the Loose-Wiles Biscuit Company built his elaborate home at 101 E. Armour. At 3520 Warwick, prominent real estate mogul John Groves settled in with his family. Widow Mrs. Alfred Toll’s household included a son, daughter-in-law, one grandson and three granddaughters, as well as seven white servants: chauffeur Edward Jaderbog, Ella Uahr, Margarete Michaelis, Mary Cunningham, Margaret Cunningham, Mary O’Roefehe, and Julia Scanlon. 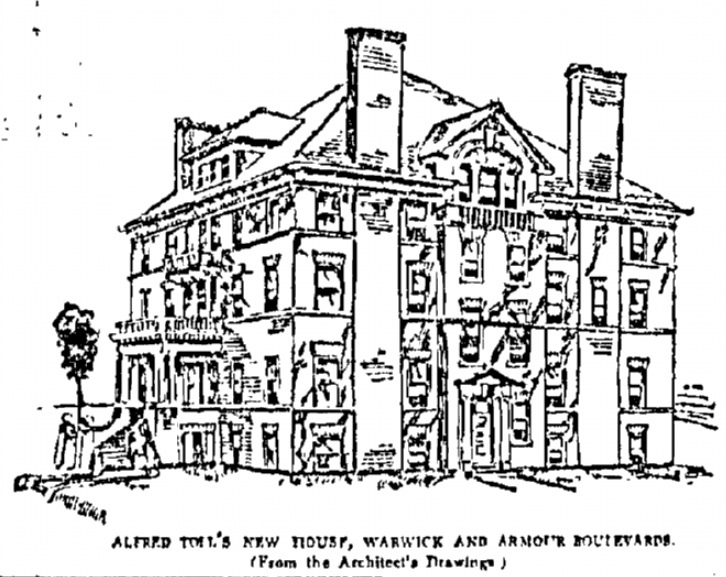 Holmes lived with wife Fleece (or Felice), a son, niece, and three white servants. Groves shared his home with his wife Elizabeth and step-daughter, as well as two white servants named Maggie Cahill and Mary Dennis and mulatto John Butler. William Hall lived with wife Adelaide, two daughters and a son, and a white servant named Grace Bosch. Chapman’s household included wife Lila, two sons, his mother, and a white Swedish servant named Sophie Nieberg. The Loose Mansion in 1992. The Toll family had moved south to a farm in the 1920s. The large home served for a while as the campus of the Kansas City Art Institute until it moved to its current home. In the 1940s Mrs. Loose moved into the city’s then-largest apartment in the Walnuts apartment building, which overlooked Jacob Loose Memorial Park, her gift to the city. As the article above suggests, Mrs. Loose sold the family home to an insurance company which planned to turn it into offices but never completed its plans. 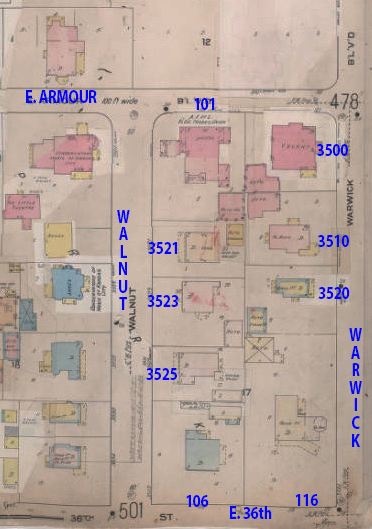 The slideshow below shows all of the houses on the block as they looked in 1940. Yeah, found the article about the Loose house. Great!